Helen D. DeRosia, age 87, of Onaway, died at home on Friday April 5, 2019. The daughter of R.B. and Esther “Lila” (St. Clair) DeRosia, Helen was born and raised in Ocqueoc, Michigan. As a young woman, Helen moved to Oak Park, Illinois to attend West Suburban Nursing School. 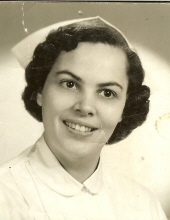 She returned to Onaway and spent her nursing career working at Russell Memorial Hospital. From 1958 until her retirement in 1986, Helen cared for many people, including her friends and neighbors. An excellent nurse, she not only was skilled in her vocation, but had a loving, gentle way of caring for her patients. Helen was an avid reader, enjoyed watching the Game Show Network, and loved to play cards. She was always ready to play a game of Skip Bo or Hand in Foot. Helen also enjoyed thrift store shopping and going to garage sales. Her family was important to her and she had close relationships with her sisters and brothers. Helen and her sister, Betty, enjoyed trading books back and forth, talking to each other often, and cooking together – Helen’s favorite was chicken and dumplings. Truly a Christian woman, Helen was not one to judge or talk about others. She was encouraging, kind, and caring. A loyal friend, she was a good listener, honest, and trustworthy. Devoted to her Christian faith, Helen put her trust in God and was a longtime member of First Baptist Church where she played the piano for many years. Helen absolutely loved being a grandmother and was a good sister. Helen’s compassion and respect for others, her love for her family, and her deep faith in God will be fondly remembered. Helen is survived by her sister, Betty Gillespie, of Millington; her adopted granddaughters, Kathy Grainger and Misty Veihl; adopted great grandson, Jackson Grainger; and adopted daughter, Diane Grainger (Lyle Cole), all of Onaway; as well as numerous nieces and nephews. Helen was preceded in death by her father, R.B. DeRosia; mother, Lila Fry; step-father, Henry Fry; sister, Marguerite Barnby; and brothers, Harold, Alfred, Richard and Ralph DeRosia. Helen’s family will receive friends at the First Baptist Church on Tuesday April 9, 2019 from 10 AM until the time of the memorial service beginning at 11:00 AM. Pastor Denver DeKeyser will officiate. Helen’s final resting place will be at Hillcrest Cemetery. Those planning an expression of sympathy please consider a donation in memory of Helen to her family to help with final expenses. To plant a tree in memory of Helen D. DeRosia, please visit our Tribute Store. "Email Address" would like to share the life celebration of Helen D. DeRosia. Click on the "link" to go to share a favorite memory or leave a condolence message for the family.